Sheepskin boots, I just love, love, love them. I can't help myself. Every Fall I try to kick the habit, and go shopping for other kinds of boots or shoes, but it always ends up a disappointment. There is nothing like the warm comfort of a pair of Uggs. This time I bought a pair of second hand Emu boots with ribbons. I liked them because they look all romantic. They cost me about 72 USD. Unfortunately this story has no happy ending, because they were wááy too big for me, even though I got my usual size. So let my tale of woe be a warning to you all. They had a lovely footbed. Imagine that, in a pair of Uggs! Since I can't afford Uggs From Australia I settled for Whooga Uggs three years ago, and I've been very happy with them. I decided to pit my Whooga Uggs against my Emu Uggs, to see who would win. Apart from the fact the Emu Uggs didn't fit me, the Whooga Uggs won because of their superior interior. Another difference is that the Emu Uggs are made from cow hide, even though the interior is wool. I still love the ribbons, but I'm not so much in love with the overall Emu Uggs model with ribbons anymore. As you can see in the picture, they're not very elegant. They look quite big and wide. If you want to try these boots for yourself, order a size down! I love my uggs too...can't kick the habit either. I have the original uggs and yes they're pricey but I find if I protect them, they last forever. You know, I have to be honest, I've never owned a pair of Uggs. Never even tried them on. Gasp! I know, the horror, right? I think I just worry that they won't have much support (are they sturdier than a slipper?) or that I'll get Schweaty Feet and never be able to take them off. My daughters love them too, so I have lots of fun shopping with them when they buy their boots. I have to admit that this is the first time I've seen a pair of uggs. Or maybe I have, I just never knew what they were called :). They look like they do a really good job of keeping your feet warm. Well, not too warm, I hope! A thing of beauty is a joy forever. I guess, a thing of joy is a beauty forever too. Don´t know if the weather´s cold enough for those but I´ve always wanted them!!! I've only owned one pair of Uggs - thanks for the comparison, very helpful! I love my Uggs. Mine aren't like the kind you pictured though. They are more of a leather cowboy type. I do think yours are adorable! I love Uggs unfortunately they are to expensive for me. But both of my daughters own a pair one has a black pair and one has brown and they trade off. They are very warm indeed. But they also keep your feet cool it is said, because of the wool. Don't worry about getting sweaty feet in real Uggs! That's one of the things that's so great about them. Tell me more Theresa!!! 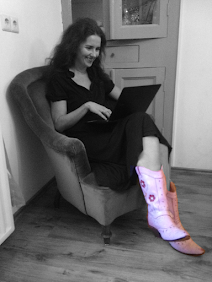 I just love western boots too! But I never wear them because they require socks. Uggs that look like western boots are my dream come through. I dont have a pair but my sister does and I have tried them on and do like them!